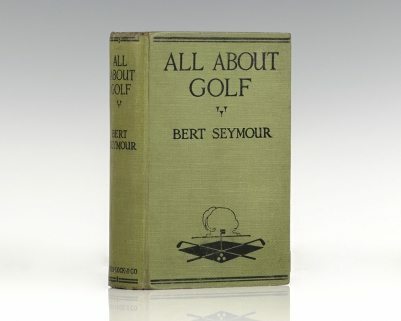 View our selection of rare and vintage sports and leisure books below. Raptis Rare Books is a trusted supplier and antiquarian bookseller and as such maintains a large inventory of rare sports and leisure books online. Be sure to check back often for new product additions as our catalog changes frequently, sometimes daily. A Cocktail Continentale: Concocted in 24 Countries Served in 38 Sips and a Kick Guaranteed. A Travel Tale That Reads Like Lightning. New York: George Sully, 1926. First edition. Octavo, original red cloth. Inscribed by the author on the front free endpaper, “To Arthur Knox- who once gave me “Hard Knocks”- but me me love him Bruce Reynolds January Tenth 1927.” A travel tail that reads like lightning. Frontispiece and 11 full page illustrations by Russell Patterson. In near fine condition. Philadelphia: Dorrance & Company, 1952. Signed limited edition of Reeve’s authoritative work on fox hunting. Octavo, original red cloth with gilt titles and tooling to the spine, Cheshire Fox Hunters emblem to the front panel, colored engraved frontispiece with tissue guard, illustrated with engravings. One of only 500 copies signed by the author, this is number 33. Additionally inscribed by the author on the half-title page, “To Miriam with best regards from the author J. Stanley Reeve.” In near fine condition. A sharp example. London: Mills & Boon, 1922. 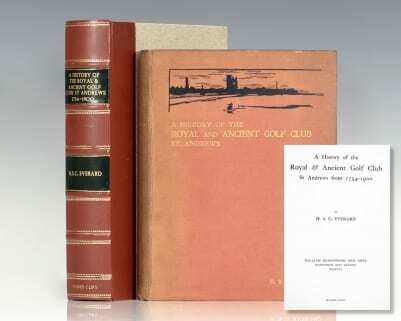 First edition of this collection of Darwin’s golf columns from The London Times. Octavo, original cloth. Presentation copy, inscribed by Bernard Darwin on the front free endpaper, “To G.M. from the author with his best regards. Sept. 1922.” It was customary for Darwin to sign “from the author”, which denoted a personal affiliation with the recipient. Rare and desirable, signed and inscribed. A History of Fly Fishing For Trout. London: Philip Allan & Company, 1921. 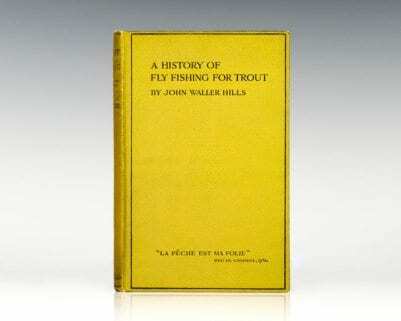 First edition of this classic on fly fishing. Octavo, original original cloth. In near fine condition with some toning to the spine. 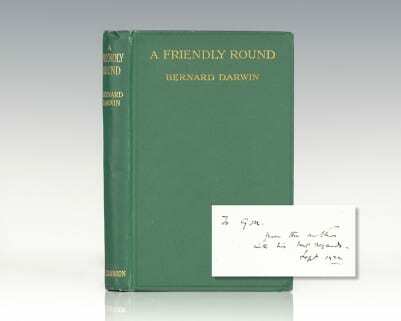 Darwin, Bernard, et al; Foreword by Sir George Cunningham. London: Cassell & Company, 1952. First edition. Quarto, original green cloth. Signed by Bernard Darwin on the front free endpaper. Frontispiece of John Taylor, illustrations throughout. Near fine in a very good dust jacket with some small chips to the front panel and one to the foot of the spine. Housed in a custom half morocco clamshell box. Books signed by Bernard Darwin are rare. A Hunting Trip in Jackson’s Hole, Wyoming, October 1913. South Bend, Indiana: Privately Printed, 1913. Scarce first edition of this detailed narrative of a month-long hunting trip throughout Jackson’s Hole, Wyoming. Octavo, original pictorial wrappers with gilt titles as issued, 8 engraved plates incorporating captioned photographs and illustrations. In near fine condition. Housed in a custom quarter morocco and chemise slipcase. Scarce, Worldcat locates only 2 other copies. A Round of Golf Courses. London: Evans Brothers Limited, 1922. First edition. Octavo, original cloth, illustrations from photographs, course maps. 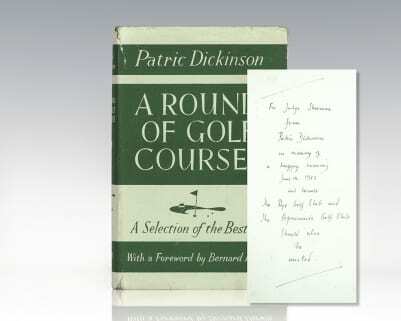 Presentation copy, inscribed by the author on the front free endpaper, “For Judge Sherman from Patric Dickinson in memory of a happy evening June 14, 1952 and because The Rye Golf Club and The Apawamis Golf Club should also be united.” Foreword by Bernard Darwin. From the library of Joseph Murdoch, with his bookplate, fine in a near fine dust jacket. Murdoch 202; D&M 15070; D&J D4350. A Turn At the Wheel. First edition of Moss’ races, which cover the years 1957-1960, the most productive of his career. Octavo, original cloth, illustrated throughout. 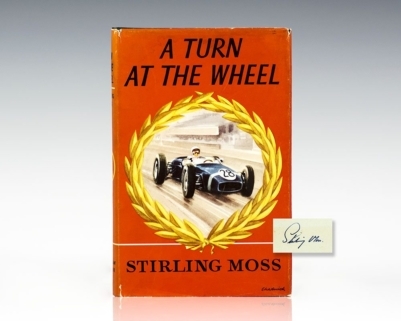 Signed by Stirling Moss on the title page. Fine in a near fine price-clipped dust jacket. A very nice example. 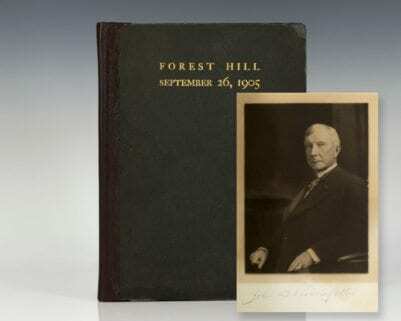 A Visit to Mr. John D. Rockefeller by Neighbors & Friends at Forest Hill. Cleveland: Vinson & Korner Co, 1905. Octavo, original boards. Signed by John D. Rockefeller beneath his frontispiece. One of 425 numbered copies, this is number 396. The work commemorates the day John D. Rockefeller, founder of Standard Oil, was visited by 300 Cleveland businessmen outside his home. Included are 38 pages of the speeches delivered that day, including ones given by Liberty E. Holden and Andrew Squire, and the speech given by Rockefeller in response. In very good condition, rebacked. Rare and desirable. African Game Trails. An Account of the African Wanderings of an American Hunter-Naturalist. First edition of Theodore Roosevelt’s classic work. Octavo, original cloth, gilt top edge, photogravure frontispiece, illustrated, 48 plates, map of Roosevelt’s route and hunting trips in Africa. Presentation copy, inscribed by the author on the front free endpaper, “To General Sir Reginald Wingate with the high regard of Theodore Roosevelt April 21st 1911.” The recipient, Reginald Wingate was a British general and administrator in Egypt and the Sudan. He earned the nom de guerre Wingate of the Sudan. In December 1899, on Lord Kitchener being summoned to South Africa, Sir Reginald Wingate succeeded him as Governor-General of the Sudan and Sirdar of the Egyptian Army, being promoted to local major general on 22 December 1899. His administration of the Anglo-Egyptian Sudan, between 1899 and 1916, achieved the colonial goals of the British Empire, with the colony regaining a degree of prosperity and its infrastructure being rebuilt and expanded. In near fine condition with light rubbing and wear to the extremities. Housed in a custom half calf clamshell box. A nice association, signed trade editions of African Game Trails are rare. First edition of Theodore Roosevelt’s classic work. Octavo, original cloth, gilt top edge, photogravure frontispiece, illustrated, 48 plates, map of Roosevelt’s route and hunting trips in Africa. Near fine in the original dust jacket with some chips and wear to the extremities. This is the first example we have seen in the dust jacket. Rare and desirable. 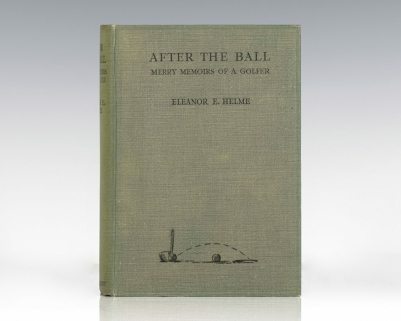 After the Ball: Merry Memoirs of a Golfer. London: Hurst & Blackett, Ltd, 1931. First edition of this memoir by Elenor Helme. Octavo, original cloth, frontispiece. With 109 illustrations by Charles Ambrose. In very good condition. 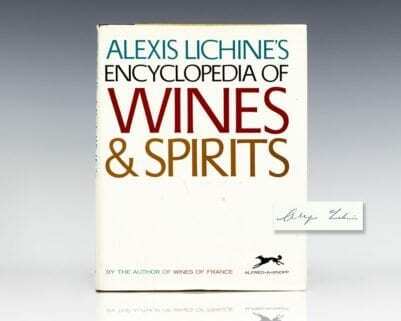 Alexis Lichine’s Encyclopedia of Wines & Spirits. New York: Alfred A. Knopf, 1967. First edition of this comprehensive guide to wines and spirits. Quarto, original half cloth. Boldly signed by Alexis Lichine on the half-title page. Near fine in a very good price-clipped dust jacket. Jacket design by Ronald Clyne. Illustrated with 52 specially prepared maps. Alexis Lichine’s Guide to the Wines and Vineyards of France. 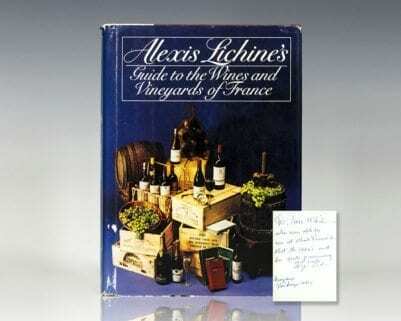 First edition of America’s foremost wine connoisseur’s comprehensive guide to the wines of France. Octavo, original half cloth, with 8 pages of photographs and 22 maps. Inscribed by the author on the front free endpaper, “To Ian White who was able to see at Chat. Prieure-L that the 1980’s will be quite promising. Best wishes, Alexis Lichine. Margaux Vendauge 1980.” The recipient, Ian White, received the book during a visit to Lichine’s estate and vineyard in Maurguax, Chateau Prieure-Lichine. Lichine purchased the estate in 1951, the wine produced from its vineyards was classified as one of only ten Fourth Growths in the historic Bourdeaux Wine Official Classification of 1855. Fine in a near fine dust jacket. Dust jacket photograph by Neal Slavin. 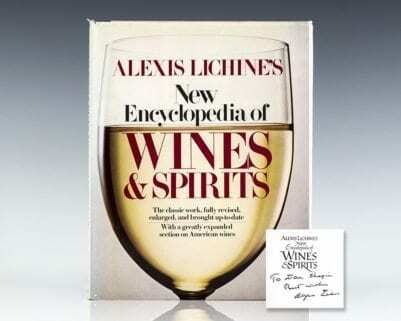 Alexis Lichine’s New Encyclopedia of Wines & Spirits. Early printing of the revised edition of this comprehensive guide to wines and spirits. Quarto, original half cloth, illustrated. Boldly inscribed by the author on the half-title page, “To Dan Chapin best wishes Alexis Lichine on the half-title page. Near fine in a near fine dust jacket. Jacket design by R. Scuddellari. In collaboration with William Fifield and with the assistance of Jonathan Bartlett, Jane Stockwood, and John Laird. All About Golf: How to Improve Your Game. London: Ward, Lock & Company, 1924. First edition. Octavo, original illustrated cloth, illustrated by 33 action photographs and many diagrams. In near fine condition.